These were just two of the examples of poor spelling by tattoo artists that led to a warning to “think before you ink” Thursday. At a time when body art has never been so popular, cases of carelessness among customers are all too common, said Veritas Language Solutions, which claimed that poorly translated foreign words or phrases were a particular problem. It gave one example of a man who wanted the Chinese symbols for “Live and let live” on his arm, but ended up with the Mandarin for “Sweet and sour chicken”. 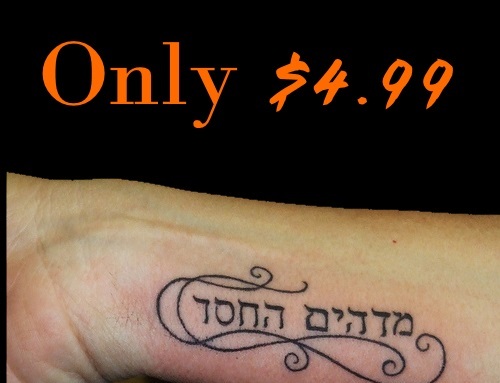 A woman who used an internet translation tool to render “I love David” into Hebrew later discovered she had inadvertently had the phrase “Babylon is the world’s leading dictionary and translation software” inked on to her back. In another example, a woman who wanted her favourite flower name written across her lower back was left with the words “Sweet Pee” above her waistline. “Equivalent does not mean literal translation, which is what happens a lot of the time and could be catastrophic for the person having the tattoo,” Ms Stephens said. Other examples of poor spelling and grammar have included tattoos reading “life go’s on”, “It’s get better” and “Streangth”, she added. Among the most famous body ink fans to fall foul of such an error is David Beckham, who reportedly decided to have his wife Victoria’s name tattooed on his left arm in Hindi script because he felt it would look less “tacky” than having it done in English. Unfortunately, an extra “h” was added into Victoria’s name, leaving the word “Vihctoria” branded on his skin. Last summer, one of the Olympic torchbearers had a tattoo done to mark her role in the pre-Games relay, only to find that the tattoo artist had misspelled the word “Olympic” as “Oylmpic”.